History - Known as the 'holy spirit root' or 'oil of angels', Angelica oil's healing powers were considered so strong as to be thought of Divine origin by Europeans. Stems of the plant were chewed during the plague of 1660 to prevent infection; when burned, the seeds and roots were thought to purify the air. Effects on the Mind - The fragrance of Angelica essential oil may help release negative feelings from traumatic events; it is emotionally calming. Many find Angelica essential oil to be an important addition to their healing or spiritually-protective blends. Effects on the Body - Listed in the British Herbal Pharmacopoeia as a specific for bronchitis associated with vascular insufficiency. A circulatory stimulant, it may be useful in some cases for poor circulation in the lower extremities. 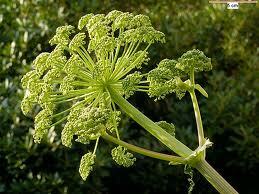 Angelica has a long history of use in supporting respiratory conditions such as colds, coughs, and sinus problems. Blends Well With - Cedarwood, Frankincense, and Sandalwood. Cautions - Generally non-toxic, isphototoxic and therefore to be avoided in sunlight. Avoid during pregnancy.